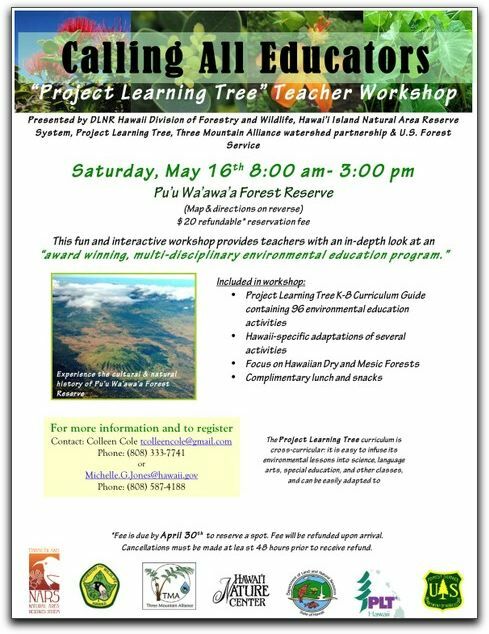 A free Project Learning Tree workshop will be offered on Saturday, May 16th 8 a.m. to 3 p.m. at Puuwaawaa Forest Reserve. Join DOFAW and Hawaii Nature Center staff for a day of hands-on learning. Contact Michelle.G.Jones@hawaii.gov or Caroline.E.Tucker@hawaii.gov for more information. There is a $20 reservation fee due by April 30th to reserve a spot. The $20 will be refunded upon arrival making the workshop free.